Origin of the Name "Catacombs Post Office"
T. PHILIP NERI (1515-1595) was chosen at our founding to be a special intercessor. St. Philip was known as a great promoter of the arts. At meetings of the Oratory (founded by him), religious singing was quite prominent. Giovanni Pierluigi da Palestrina was a lifelong friend and disciple and even died in the arms of St. Philip in 1594. 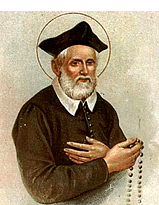 Palestrina’s predecessor at the Vatican, Giovanni Animuccia, played a leading role in producing music for the Oratory. Thomas Luis de Victoria even lived in St. Philip’s house for five years. St. Philip felt constantly drawn to the solitude of the Catacombs. Unlike the pagan burial places of the time, the Catacombs (burial places of the early Christians) had nothing “spooky” about them. Here lay the bones of many martyrs—and the name “sleeping room of the saints” was perfectly fitting. The Christians lay on both sides of long underground passages, widened in some places to create niches. For St. Philip, too, this was the resting place of the early Christians as they awaited the resurrection. This great saint often spent entire nights in prayer there. A Dominican of the convent of Santa Maria Sopra Minerva claimed that Philip had “lived” there for ten years. As St. Philip was praying in the Catacombs of St. Sebastian a few days before Pentecost in 1544, the well-known “miracle of his heart” took place, similar to the stigmata given to St. Francis of Assisi. To read more about this, we recommend the work of Oratorian Father Paul Türks. Corpus Christi Watershed has a special relationship with the Oratory of St. Philip Neri, and we are currently producing a new Missal for Mass [URL] which prominently features the Oratorian fathers, especially Blessed Cardinal Newman. Please take a few seconds to view this CCW video (embedded on the left), narrated by Fr. Guy Nicholls. To watch all twelve of these delightful videos, please click here [URL]. We have also created a special Beatification film about Blessed Cardinal Newman, “Lead, Kindly Light” [video]. Click here [video] to listen to St. Philip in his School.